Mange with Lidia Bastianich at SPAC. 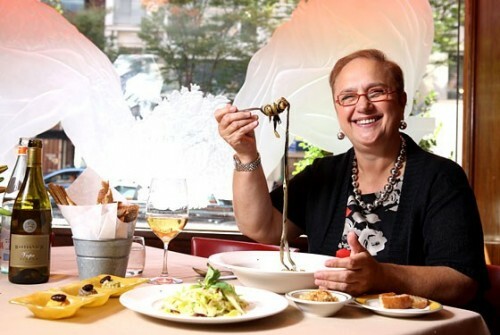 Celebrity chef, best-selling author and successful restaurateur Lidia Bastianich will highlight the 2010 Saratoga Wine & Food and Fall Ferrari Festival presented by the Italian Trade Commission, September 10 – 12. Bastianich joins world-class Italian auto designer Andrea Zagato and Presenting Sponsor, the Italian Trade Commission, in headlining the festival, a series of events over three days celebrating Italy’s excellence in wine, food and automobiles. Proceeds from the event will benefit Saratoga Performing Arts Center’s educational programs. The centerpiece of the festival - the Grand Tasting and Ferrari Concours on Saturday, September 11 - will feature hundreds of fine Italian and international wines, delicacies from the region’s top chefs, Italian couture, luxury auctions, fascinating seminars and a Ferrari Concours. The Italian Trade Commission will host an Italian Pavilion showcasing the Pure Flavors of Italy with over 35 importers of Italian wines and authentic quality food products. New to the festival schedule in 2010 are two events including the “After Party” sponsored by Ketel One -- a post-Grand Tasting event that will offer guests a relaxed lounge atmosphere with gourmet food, spirits and music. Also new is an Italian Sparkling Jazz Brunch at Saratoga National Golf Course featuring an Italian-inspired brunch menu, Italian couture fashion show and live music. Celebrating its 10th year, the festival is presented by Saratoga Performing Arts Center with the partnership of the Saratoga Automobile Museum. Proceeds raised at the event will benefit the education programs of each organization. “For our festival’s milestone tenth year, we will celebrate Italy's finest in wine, food and auto design with the best possible ambassadors; the ‘first lady of Italian cooking’ Lidia Bastianich, our presenting sponsor, the Italian Trade Commission, and famed auto designer Andrea Zagato. We are thrilled to welcome these honored guests to this year’s Festival and to celebrate with them, the Italian influence on the culture and traditions of America,” said Marcia J. White, SPAC’s President & Executive Director. The Italian Trade Commission will host several seminars, including an exploration of Italy’s wines by Kevin Zraly, celebrated wine expert, educator and author of the best-selling wine book in the US, Windows on the World Complete Wine Course. Zraly will share insights and advice on understanding, selecting and appreciating Italian wines. Notable member of the trade and epicurean, Lou Di Palo of Di Palo Selects, will discuss authentic Italian gourmet items. Lidia Bastianich will greet festival guests at a book signing for her latest cookbook, Lidia Cooks from the Heart of Italy: A Feast of 175 Regional Recipes. In this, her sixth cookbook, Ms. Bastianich, takes readers on a culinary tour of 12 key regions of Italy. The book features 175 authentic recipes, personal memories and vivid photographs. Historical perspective on the regions and their culinary traditions is contributed by Lidia’s daughter Tanya Bastiniach Manuali. Bastianich is the host of three PBS cooking shows including the Emmy-nominated and James Beard award-winning cooking series, Lidia’s Italy and the author of several best-selling cookbooks including her most recent, Lidia Cooks from the Heart of Italy. She is the chef/owner of four acclaimed New York City restaurants - Felidia, Becco, Esca and Del Posto, as well as Lidia's in Pittsburgh and Kansas City. She and her son Joseph also produce award-winning wines at their Bastianich Vineyards in Friuli, Italy. Italian achievements in auto design will be on display at the Grand Tasting’s Ferrari Concours presented by the Saratoga Automobile Museum. Dr. Andrea Zagato, President and CEO of the legendary Zagato design company, will headline the event. Dr. Zagato’s grandfather Ugo Zagato, founded the company which originated the use of aircraft techniques in the design and construction of lightweight automobile bodies. Zagato designed numerous models for Ferrari, Alfa Romeo, Fiat and Maserati, among others. * A Ferrari Concours highlighted by significant carrozzeria-bodied, production and competition cars. Ferraris will be joined by a special exhibit of Zagato-bodied automobiles including an ultra-rare Ferrari 575 GT Zagato, one of just six worldwide. * A “100 Years of Alfa Romeo” exhibit featuring both pre- and post-war Alfas. Also part of the exhibit will be the Alfa Romeo BAT 11 Design Study. Although BAT stood for Berlinetta Aerodinamica Tecnica—a series of aerodynamic studies—each of the automobiles showed a strong resemblance to a winged bat with its exaggerated tailfins. BAT 11 has previously been shown at Pebble Beach, Amelia Island and other major concours in both the U.S. and Europe. * A “Heritage of Italian Design Seminar” led by Dr. Andrea Zagato, with participants Piero Rivolta and Jason Castriotta representing generations of design from Zagato, Bertone and Pininfarina. The festival’s rising profile has attracted international and national sponsors including the Italian Trade Commission, Key Private Bank, Ketel One Vodka, HSBC Bank, Zagat’s, Wide World Ferrari Maserati, Acela, UBS Wealth Management, Marriott Courtyard, Empire Merchants North, Stölzle, Arrive, Grana Padano, Di Palo Selects and Comitti Yachts. Valued regional sponsors include Saratoga Marketing Group, Times Union, 101.3 FM and Saratoga Eagle. Ferrari, Maserati, Alfa Romeo and Zagato-bodied automobiles will follow a 1 ½ hour route through the Adirondacks and Lake George area. Guests will have lunch at the historic Lake George Club and enjoy Comitti Italian mahogany speedboat rides. Gala evening on SPAC’s Amphitheatre stage featuring exquisite Italian wines, an innovative Italian menu and dancing to live music. The Italian Trade Commission, Lidia Bastianich and Andrea Zagato will be honored. * Dedicated Italian Pavilion showcasing the Real Flavors of Italy. Italian wines, cheeses, olive oils and other specialty products at the pavilion hosted by the Italian Trade Commission. * Extensive silent auction featuring travel, dining and entertainment gift certificates, premium wines, boutique clothing and gift items and more. Live Auction, conducted by international wine expert and author Kevin Zraly, featuring exotic travel packages, custom jewelry, rare wines, SPAC tickets, original artwork and more. Prosecco and Italian desserts served. An exclusive lounge party offering savory food, spirits and live music in a relaxed atmosphere. Presented by SPAC’s Junior Committee and sponsored by Ketel One. An elegant brunch at the Saratoga National Golf Course accompanied by live jazz and with Italian couture. Generously sponsored by UBS Wealth Management. For a full schedule of festival events and to purchase tickets, visit www.spac.org, call 518-584-9330 or visit SPAC’s Route 50 Box Office.